The July 4th ‘Red, White and Blue 20% off Sale’ at GDC Home starts this Friday, June 30th! Be sure to rock your 4th of July backyard party with red, white and blue furniture, rugs, fabrics, tableware and more. GDC Home has a vast selection of custom cushions and outdoor fabric, outdoor rugs and furniture, ice buckets, serving trays and more. Add a white slipcover to an outdoor sofa and accent it with red or blue pillows for a festive, patriotic look. GDC Home offers top-notch selections of outdoor furniture and custom fabric in Charleston, Mount Pleasant and Kiawah in South Carolina. A blue and white striped pattern on an outdoor rug could be another way to get the patriotic spirit flowing. They can be used under furniture, on the pool deck, thrown on the grass as a picnic blanket. Try layering a bunch of different patterns in the same color family for an outdoor movie night. If red and blue feels a little much for you, try using them as accent colors on white furniture. Maybe some throw pillows or throw blanket. GDC’s July 4th sale takes place at all three GDC Home locations in Charleston, Mt. Pleasant, and Kiawah Island. Each store has talented Design Consultants on hand to assist with everything from designing your backyard party to decorating an entire home. 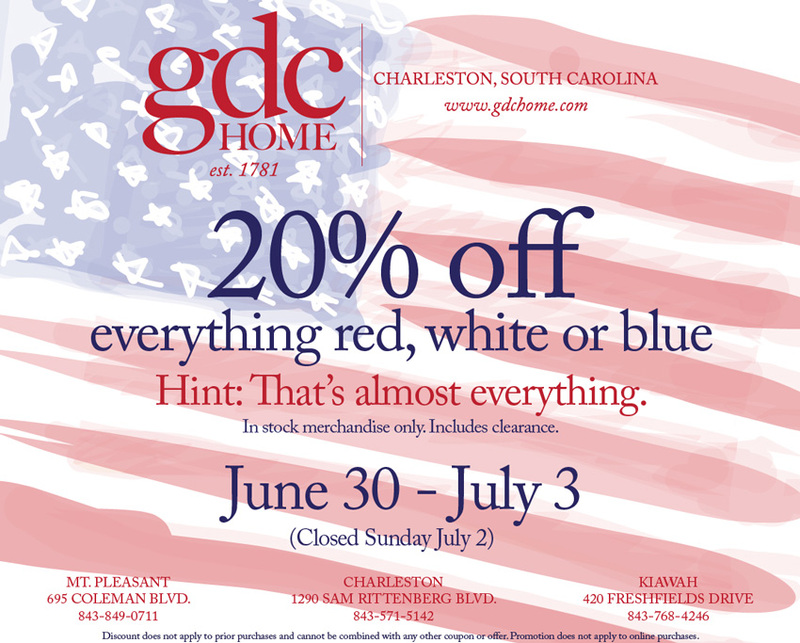 So be sure to get 4th-of-July ready and summer-ready this weekend at GDC Home during the 20% of red, white and blue sale!